Sister Maria is a soft-spoken, calm woman with kind, soft, yet perceptive eyes. Her quiet manner would probably cause her not to shine out in a crowd. This is partly what makes her a hero to me. I’ve been watching her for almost a week now. To me, she’s the Mother Teresa of Cairo. When she enters the dining room, all conversation ceases. Not because the sisters are afraid of her, but because in her presence, they realize that in a convent, mealtimes are meant to spent in contemplative silence. At least, this is the feeling I get while observing the silence in the dining room. She can probably read me like a book, but it doesn’t matter. I have nothing to hide. Besides, she herself is a fascinating book I’m also trying to read. Silence does not always reign at the table. Sometimes there is lively talk, and Sister Maria laughs and shares with the others. I admire the glints of spiritual intelligence that occasionally sparkle our conversations. I comment on how many girls have some version or other of the name “Mary”. I have met many girls and women named “Mariem”. At least one Mary. A Marina and a Martina. There’s Marleen, and a few Maria’s, including the Sister. “I often think about the qualities of this woman who was chosen to be the mother of Jesus,” she says. “What an amazing person. I wonder if it is all that meditating on Mary that makes Sister Maria so soft and gentle, so accepting of what life may hand her, so calm and connected. Not only is her name Maria, but she also belongs to the order of the Sisters of St. Mary. I tell her about my first trip to Egypt and the visit to the Philae temple in Aswan, where I first heard the story of Isis and Osiris, and how it excited me. The parallels to the story of the Virgin Mary giving birth to a son, Jesus, who is to be a savior, are so clear. I tell her how excited I was to hear of the Pharaoh Akhenaten, who introduced monotheism to Egypt. I found it exciting to hear of a man outside of the Bible stories – an Egyptian who believed in one invisible God, a spirit God, who created the entire universe. I have watched her arbitrate disputes. I hear only the name of one of the sisters, and I know someone is complaining about someone else. Sister Maria listens calmly and gives her input. She listens to the arguments of the people complaining. She is not autocratic, not authoritarian; she’s open for discussion, and I have the feeling that her sisters know that she will deal with them fairly. I think I heard the sisters discussing some topic with Sister Maria yesterday, perhaps political, or theological. It was a heated discussion, but each sister was free to state her opinions openly. Sister Maria was authoritative, yet open to whatever it was they were discussing. I get the sense that she is used to being around dignitaries who come to visit the center. Twice this week I’ve seen people whose appearance suggests worldly importance. At these times she chats with them openly and pleasantly. I once knew another woman in a similar position whose humility also commanded respect, and who, now deceased, is a candidate for sainthood in the Roman Catholic Church – Dorothy Day, the founder of the Catholic Worker. To me, Sister Maria should also be made a saint, but she is already so in God’s eyes, and that’s all that really counts. In the arrogant inexperience my youth (I was only twenty-two when I met Dorothy Day), I didn’t understand some of the things that I saw and now see happening around Sister Maria. People defer to her. When I lived with Dorothy Day, I thought the deference she received was inappropriate. Now, watching Sister Maria’s calm acceptance of it, I think Dorothy was probably annoyed or perhaps ironically amused by it but, knowing how people are, she graciously put up with it. Both she and Sister Maria chose to live among the poor instead of seeking worldly success. And yet, choosing to serve the poor and sticking to it, amazing things happen. There is success when a person commits her life to improving the lives of those who are weaker, persistently continuing the work, whatever the setbacks. Projects are successful, new projects start, and people’s lives start to turn around. This success commands the respect of many of those who have achieved worldly success in terms of acclaim, honor and wealth. I don’t know if Sister Maria is famous. Not knowing makes it a lot easier for me to talk to her. She is approachable (after mealtimes), and always understands what I am trying to tell her. If she is famous, she seems utterly unfazed by it. She doesn’t talk about herself, only about the people who serve alongside her, and the people they serve. “You must see the work in the home for the handicapped children,” she tells me. These, I think, are the very poorest of the poor. They have been abandoned by almost everybody. One of the sisters tells me that in Egypt, people are afraid of mentally handicapped people. Not Sister Maria. One of them gets to sit outside the hospital every evening and sell snacks to passers-by. How wonderful that in this center, they are given a position of dignity. 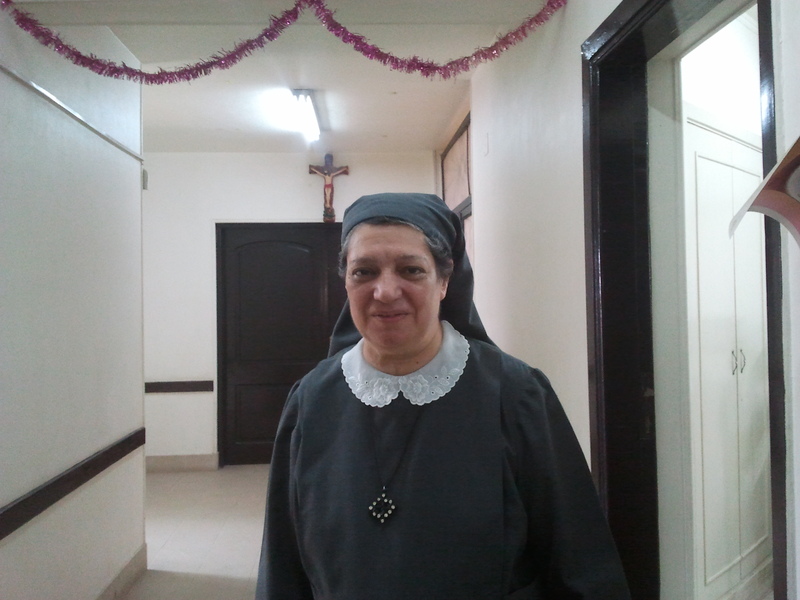 The Salam Center was founded over thirty years ago as a co-project by Soeur Emmanuelle, a French-Belgian Catholic nun known throughout Europe for her work, and by the Coptic Sisters of St. Mary, the order Sr. Maria belongs to. Sr. Emmanuelle has since passed on, but Sister Maria, who came to the center over twenty years ago, became her friend and colleague, and is now carrying on her work, adding new projects to what Sr. Emmanuelle began. She oversees every project of this center. There are many of them. There’s the hospital, for starters. There are free schools for the children of the garbage workers. There are kindergartens, a children’s health clinic, where children are treated and parents instructed in hygiene, nutrition and health hazards. The clinic educates parents on the harmfulness of female genital mutilation. There’s the center for the handicapped, a home for the elderly, a team that visits and cares for the elderly who live in their homes. There is a women’s program, where parents are educated in topics such as gender equality, civil rights, drug prevention, and prevention of female genital mutilation. Social workers go and visit the homes, helping parents obtain important things they need, whether it be documentation or funding. The women’s center has seamstresses who teach sewing, so that women can have an income. There are training programs for young people, where they can learn things like mechanics, computer operating and repair, and hairdressing. “Everybody I meet is so warm and kind!” I say to Sister Maria. “Everybody I meet seems to talk about a deep love for Jesus, but it isn’t just talk. They all seem to show the love I think characterized Jesus.” She nods her head. I ask, “Do you interview all the people who come to work here?” She says yes. “Are you looking people with open hearts more than the right theology?” Again she nods her head and says, the one quality she and everyone else involved in the hiring process is looking for is hearts that honor, that want to love and serve the poor. This is what makes her, to me, a saint. Because everything this woman is, is about following and serving Jesus Christ.